Some people just have a spark that shows so clearly to others, and is something that becomes part of their personality. Others might struggle to really share this light with others, and is something that is much more internal and only seen by a lucky few. 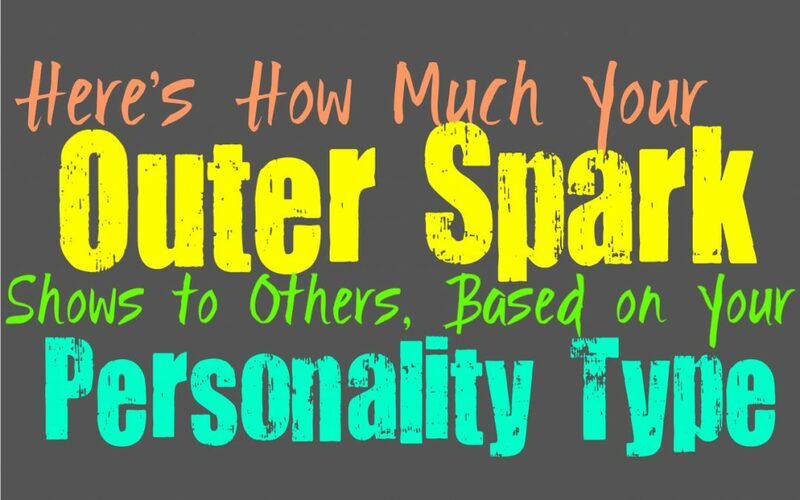 Here is how much your outer spark shows to others, based on your personality type. The INFJs spark or light can be something that they keep to themselves, often intentionally. They can sometimes be fearful of vulnerability, especially with new people. INFJs often have an intensity about them which others can recognize, but their true spark is something they often keep hidden. It can be challenging for the INFJ to really show parts of their inner world to those around them. It often requires someone who understands the INFJ and connects with them, and is willing to be patient as they peel back the many layers of their personality. ENFJs often know how to keep parts of themselves hidden, but yet their spark can often show outwardly as well. They have rather vibrant personalities, which they enjoy sharing with those around them. ENFJs want to make connections and enjoy being close to the people they love. For them it important to show that outer spark in a way that others can appreciate and often feel drawn to. They enjoy being someone that others are happy around, and so they want this spark of theirs to really bring light and joy to those around them. While INFPs are introverts who keep a lot of their feelings private, at the same time they do have a spark that can show outwardly. They don’t necessarily try to show this light to others, but it is something that often cannot be hidden. INFPs have rich emotions and dreamy personalities, which makes it rather hard for them to really hide from others. While they might struggle to open up completely, they are still be sincere and passionate people, and this is something that cannot be hidden from anyone who pays attention. ENFPs are extremely passionate and outgoing people, and so their spark is often rather obvious to others. This isn’t something they want to hide from the world, it is usually quite the opposite. ENFPs enjoy sharing their spark with others and don’t like having to hide it away from the world. They are friendly and fun people, who just want to live their lives going after their dreams and enjoying their loved ones. Their passionate and vibrant spirit is something that certainly translates outwardly, making their spark something others can see clearly. The INTJs outer spark is often something that is only seen by people who pay close attention to their behaviors. It can be caught when the INTJ is eagerly learning about something, or explaining a theory that they are passionate about. Most of the time the INTJs spark can be rather internal, since they can be stoic on the outside. The INTJs spark is something that shines through via their intelligence and passion for learning. They are definitely passionate people, it just isn’t easy for them to express themselves outwardly for the world to see. ENTJs do have somewhat of a spark to their personality, but it doesn’t always show outwardly. They are passionate people but when they are focused on something they can seem rather intense and zoned in. They are simply very efficient and hardworking people who don’t like allowing emotions to stand in their way. When the ENTJ is doing something creative this is often when their spark shows outwardly. They are passionate people who enjoy being able to dive into things that fulfill and enrich their spirits. INTPs are extremely intense people with a truly powerful spark, it just isn’t something that can be easily seen by others. Their spark is very internal and doesn’t readily show so that others can recognize or even understand it. It is something that people do catch a glimpse of if they get close enough to the INTP, and is certainly a wonderful experience for those that love them. INTPs certainly have quite the spark, it is just something that is very internal and not seen outwardly. ENTPs often have an outer spark which shows rather vibrantly for others to see. While there are many parts of themselves that they chose to hide from most people, their passions and exuberance is often rather apparent to others. ENTPs are eager people who enjoy experiencing new things and interacting with others. They can have rather over the top personalities sometimes, especially when they are enjoying being center of attention. ENTPs also have bright senses of humor which makes them truly fun to be around, and all these things add up to show a rather bright outer spark. ISTJs can often appear rather stoic and reserved, and don’t find it easy to outwardly express their spark. They may be passionate about certain things and feel things deeply, but those parts of them just don’t show easily. ISTJs keep most of their feelings and thoughts to themselves, and have a hard time truly expressing themselves. For ISTJs it just doesn’t feel natural to express themselves in emotional or passionate ways, at least not for others to see. ESTJs are focused and driven people, but they keep their emotions to themselves. They can often appear rather stoic to most people, without much of an outward spark. While ESTJs care deeply about their loved ones and have truly passionate aspects to their personality, it just doesn’t show easily to others. ESTJs focus so much on efficiency that it can be difficult for their inner spark to show outwardly. ISFJs are warm and loving people, and their spark does often show outwardly. While they can be seen as reserved and internal, they still have a light that shines for others to see. ISFJs have a sense of warmth and compassion which is definitely something that expresses itself outwardly. They enjoy being someone that others can rely on, and don’t want to be seen as a person who hides themselves from others. ISFJs definitely have an outward spark, and this is something others can see if they pay attention. ESFJs do often have a spark that shows outwardly, especially towards the people they’re close to. When the ESFJ cares for someone they often show their passions and their spark in a way that is rather obvious. They enjoy being able to show this side of themselves to others, especially when they care about someone. ESFJs can keep parts of themselves inside since they fear being vulnerable, but their spark is something they can’t really keep hidden. And so they enjoy being someone that others come to and enjoy their presence. ISTPs can be rather internalized people and so their spark isn’t something they really want to share with others. They keep to themselves most of the time and prefer to only show themselves to people they trust and are close to. ISTPs don’t usually like being vulnerable enough to really show the spark to their personality, and so it is often kept internalized. This part of them is only seen by those closes to the ISTP, the people who get a glimpse at that inner spark. ESTPs definitely have an outer spark and passion which shows to the people around them. They are vibrant people who often possess a hunger for life and the world around them. They enjoy being able to experience new things and live their lives seeking out whatever brings them joy. ESTPs are passionate and intense people, with a spark that certainly shows outwardly and is often hard to miss. While ISFPs can appear internalized a lot of the time, they do have a spark which shows if people pay attention. They are passionate people, with a light that shines even if they aren’t speaking. ISFPs don’t need to be outgoing or over the top for their spark to truly show itself to others. They are passionate people with complex inner emotions and deep imaginations. These qualities make them truly wonderful and intense people, especially for anyone who takes the time to get to know them. ESFPs definitely have an outer spark which is something that is truly hard to miss. They have a passion and vibrancy which shines through in almost everything they do. ESFPs are not dull people, and they truly hate having to hide themselves away from others. They enjoy being able to express their passionate soul, and allow their spark to show for the world to see. ESFPs are definitely exciting people who are full of life and have a rather bright outer light.